So these are them. Three years ago these brownies were the first thing I ever made, uncovering my hidden passion for baking. I can't quite remember if I wanted brownies and stumbled onto this recipe; or if I stumbled on the recipe and then wanted brownies. 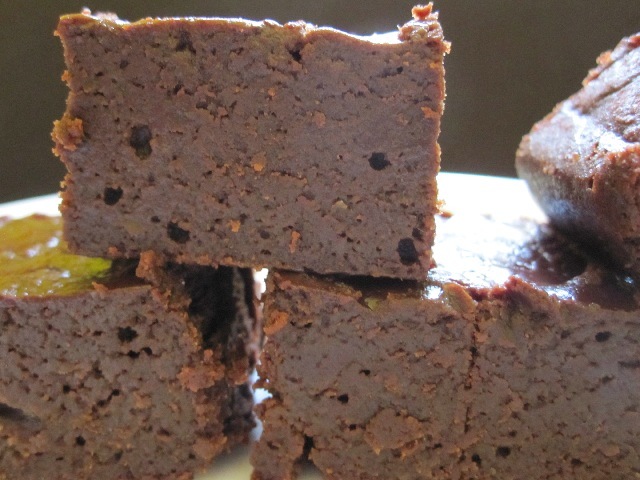 What I do know is that after I saw the image of these brownies on the Food Network Canada site I was fixated. Then and there I made the decision that come my birthday vacation I was going to bake banana brownies. I remember telling everyone my plans and the subsequent looks, smirks, and “okaaays” I received, but I was determined. Granted, I didn't have the first clue what I was doing :). I at least made sure to check that I had the correct pan, and as the day approached asked my mother to pick up the required ingredients. I was on my way. I was excited and nervous. I wanted to prove that I could actually make something that would taste good, and also, I really wanted brownies :). I have a few other strong memories surrounding this recipe. My first taste is a key one since the brownies had been out of the oven roughly ten minutes before I cut my first piece. They were nearly molten and may have burned my tongue, but wow were they rich. I offered pieces to my brother and father (which were eaten with forks because it was still so hot) and drove a few pieces to my mother and her coworkers. Everyone seemed to enjoy them. Though I'm not going to lie, after the brownies had cooled I began to question precisely how “good” they were. The flavour was unique. It was rich with chocolate and strong with banana, but the banana flavour was almost jarring, and made it taste “different, if you weren't expecting it (my brother's girlfriend looked like she ate soap when she tried them). Regardless I was proud that I managed to produce anything other than disaster (something I still have trouble with :) ). I mentioned the final memory of these brownies in my birthday post. I stood, staring at a half full pan of brownies and I found myself at a crossroads. I was back to work the next day and I was either going to finish them all myself or it was all going into the trash. As difficult as it was, I walked outside, turned the pan upside-down and into the compost it went. At the time all of this happened I didn't know that it would lead me to bake for Christmas and then Easter, then Thanksgiving. Each time doing a little more in both volume and complexity. I was hooked. Although I have made plenty of brownies since then, I have always wanted to return to this recipe. I have learned a lot since that fateful day and I now have a better understanding of the science of baking and its processes. I was eager to improve on the recipe and alter it to my tastes. Despite what the current recipe says I know for a fact that the original recipe used a 9x13” pan, and not wanting to visit the compost again, I decided to half the recipe. I used both semi and unsweetened chocolate which is something I do with a lot of brownies. It allows me greater control of the sweetness and the unsweetened chocolate would help balance the flavour of the banana. I also changed the sugar, using half brown to introduce a little molasses and add a bit more moisture to keep the brownies soft. But most significantly, I removed the baking powder. Per usual, I didn't want cakey brownies, it would be fudgy all the way. This time when the brownies came out of the oven I let them cool completely before indulging. I was nervous making the first cut and taking my first piece. I took a bite, the brownie melted in my mouth, and I melted with it. It was incredible. Any worry I had about the flavour literally dissolved at that moment. It was extremely rich in chocolate, not too sweet, and the banana flavour was strong but not overpowering. It was like eating the most decadently rich chocolate banana bread you could imagine. But this was in flavour only, texture wise I can't even begin to describe it. They were so exceptionally moist and soft and light. They might be in a category of their own. Not cakey or chewy and unlike any fudgy brownie I had ever had. There was almost no chew or bite to them, no substance. It was like it had just enough structure to keep them from becoming a liquid. Some felt it was similar to a truffle or ganache, but it was much softer than that. I kept comparing the texture to pumpkin pie filing, though it was more stiff. But whatever it was, however you describe it, it was mind blowing. I think I ate half the pan. I know I ate half the pan. My return to this recipe was a very happy moment for me. It's true that it's not complicated, but it brought back some memories and made me reflect a bit on what I have learned since baking them originally. This time I wanted them perfect with no questioning of their flavour; and for me, to me, I accomplished this. I think about making them again all the time. They're that good. For any aspiring bakers who may be reading this, who may have stumbled onto this recipe looking for their first brownie, be warned; starting on this path could set you on a journey of mountain highs and trench lows. You will garner praise from others, but be critical of yourself. And you will begin to accumulate more specialty equipment, pans, chocolates, extracts, and flours then you ever knew existed. But you know what? I wouldn't trade it for a thing :). Preheat oven to 325F and line an 8” square pan with foil and lightly grease. Place a medium heat proof bowl over a pot of simmering water. Add both chocolates and butter and heat until completely melted. Remove from heat and set aside to cool. When the chocolate is luke warm, add both sugars and stir until completely combined. Add eggs one at a time, stirring until combined. Add banana and stir until combined. Add vanilla and stir until combined. Pour batter into prepared pan and bake for 25-30 minutes or until toothpick comes out clean or with a few moist crumbs (this took me 25 minutes). Remember: a slightly underdone brownie is better than a slightly overdone brownie :). Adam, thanks for the cookie scoop tip. I am going to check out Target and Williams-Sonoma. I know Target will be cheaper, but I have a gift certificate to Williams-Sonoma. Your banana brownies have similar ingredients to mine. I will need to try yours! The explanation you provide of your brownie's texture is intriguing! 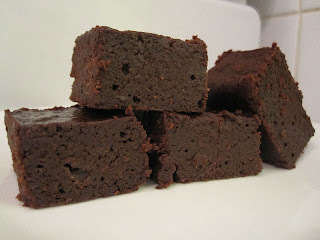 Have you seen my banana adaptation of Anna's Effortless Fudge Brownies Redux on Cookie Madness? They are called Minnesota State Fair winning Brownies! — Chocolate/Banana (They won 3rd place once, then nothing the next year). They have an amazingly shiny crust...But sometimes I under bake them in they end up exactly like fudge-not a problem if I'm entering them in a fudge contest I guess! The path of the brownie is a dark and treacherous road. Embrace the dark side! Adam, thanks for the intro!!! Great to meet both of you! I purchased 10 bags of CC for my brownies and CCC to enter into the fair. They were on clearance at Target! Yippee! @Gloria: Very welcome on the tip ;). That's a lot of chocolate :). And I took a look at your brownie recipe and I think I know where the difference is. Mine has half the sugar and likely six times the banana, which is why mine was so soft. I got a super shiny top but it was very soft and slightly sticky. All that moisture from the banana I would assume. I've had Anna's recipe bookmarked for some time and would love to try it out, I mean who am I to argue with award winning stuff :)? (Congrats by the way :) ). @Lynn: If I embrace the dark side anymore my voice is going to drop a few octaves and I'll require a respirator :). Adam, I wasn't sure I'd like banana in my brownies, but I tried Gloria's and it's now one of my favorite recipes. Looks like I'll have to try yours as well. Great story too, btw.